I put up all these notes, which I previously posted elsewhere as I believe this webboard could cater to a wider audience of coffee lovers. Comment/criticisms are all welcome and hope these notes are helpful to you when you happen to be in the area. I only post a positive comment as I don't feel well during the trip and want to give the benefit of the doubt to these cafes. From what I know, they are in the forefront of Indie cafe in Bangkok. Location: on elevator lobby floor Bangkok, Thailand, 10130. El Mello, a must try Indie cafe in Bangkok. I'm not feeling well that day so I will give the benefit of the doubt, ie on comment on the one that tastes good. Dalle Corte + Anfim Super Caimano Titanium... Surprisingly very clean cup, reminding me of LM GS/3 and Synesso though with a lighter body which is good for showing off nuances in the coffee. House blend espresso with robusta in the blend. Its house blend espresso was rather interesting. Blended by the barista himself, Khun Po (pronounce more like 坡 in cantonese) is an ex-Sweet Guilt barista. This is more of an Indie style coffee with some nice exotic flowery aroma and expertly pulled with a nice tiger fleck, a good pull indeed. However, you need to get pass through the “stuffy” hit at the first few sips which some may turn it down almost right away. This house blend has a cost in mind. The reason is the robusta in its blend to reduce cost for the milk drink. There is Thai coffee as a base (Thai coffee was considered inferior in taste and lower in price) with robusta from Uganda for that exotic and stuffy note and Sumatra for the body. Even though I don’t like robusta in my coffee, this one wasn’t too bad and I don’t feel much of the caffeine effect. Cookie to cut down the effect of caffeine. Quite sweet which seemed to be typical for Thai taste profile but neither good nor bad. Its single origin offering from Mr. Lee in Khon Khen, Northeastern Thailand (previously an agent of Clover). The other SO is Yirgachaffe which I had one too many at the time. The shop is in Northeastern Thailand, approximately 7 hour drive or you could take a plane there. The resulting cup. It was just so so with a usual smoky note that seemed to be synonymous with the coffee from this country. The rest was mostly smooth but nothing is quite memorable. Maybe I should try this one as an espresso. Next time. Now, this is a star. Timeless blend, a special offering from Bangkok Espresso Lab (bkksprolab.com). IIRC, I had this blend couple time before, at the old Sweet Guilt and at its roaster. The one at Sweet Guilt was a bit better than horrible, bitter, sour (not acidity). The second one at its roaster was much better and pulled from Speester and Anfim Super Caimano Titanium. However, it was way too round for me the flavor wasn’t a clear cut and the roaster and the barista, same person, told me that’s the way he likes it. Large window helps bring sunlight to brighten up the cafe. Quite hard to get for Indie cafe whose location was quite limited as the mall management typically prefers a brandname/anchor tenant like Starbucks. Nevertheless, I was told that after El Mello opened, the business at the nearby Starbucks dropped significantly. Hope this will be the trend as Starbucks will fight back and at the end of the day benefits us all coffee lovers. From my seat at the counter looking out. The wallpaper wasn't my style but somehow it works well with the creamy tone of the shop. Hallway going into the shop. 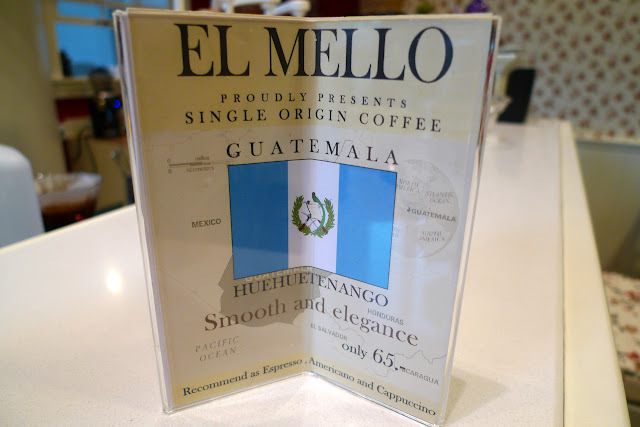 Barista told me that the business at the nearby Starbucks dropped considerably after El Mello opened. I thought I'll be the only there at the time (3PM in the afternoon) but the shop was quite busy all the way I couldn't really talk for long with barista. Way to go! To me, this El Mello is the place you should drop by in Bangkok for good coffee even though it was quite out of the way for most tourists in Bangkok. Too bad, the café closed on Saturday and Sunday and opens on work days and work hours, ie 8-4:30PM and it wasn’t quite close to MRT station too. Another nice place, run by a very nice guy, Khun Vudh, a owner and master roaster who is quite active in the Indie scene in Thailand. (Khun = Mr. in English as Thai typically go by first name. Call people by last name sounds really strange). Its location is perfect to do a cafe crawl with El Mello (see an earlier post) as it's on the same road though you need a taxi/car to go to Seat2cup, which is inside an office building further up north from El Mello. If you like a traditional style coffee, this is the place.